The world was shocked March 16 by photos of International Solidarity Movement volunteer Rachel Corrie standing before an Israeli bulldozer that, seconds later, crushed her to death. The international outcry didn’t faze the Israeli government, however, which on April 5 shot ISM member Brian Avery in the face and on April 11 shot Tom Hurndall, who has been declared brain dead. While global attention was focused on the U.S. invasion of Iraq, Israeli tanks and bulldozers drove roughshod over Palestinian towns, killing Associated Press journalist Nazih Darwazeh in Nablus April 20 and British photographer James Miller on May 2. In the midst of this rampage, Southern California humanitarian groups decided to raise funds for ISM and honor Rachel Corrie’s parents for their dignity throughout the tragedy of losing their daughter. The Israeli propaganda machine immediately launched its spin on the unnecessary deaths of American and British peace advocates, but Israel’s pattern of threatening, beating and now murdering foreign observers refutes the occupier’s explanations. 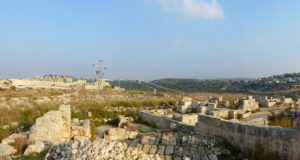 Eyewitnesses report that Rachel stood a couple of yards in front of the American-made Caterpillar D9 bulldozer about to demolish the home of a Palestinian physician. She looked the driver in the eye before he buried her in debris and drove over her, then went into reverse and crushed her a second time. Israel says the driver, who has not been reprimanded, said he did not see the American woman in a bright orange day-glo vest. Just as invitations were issued to the May 17 event, Israeli troops raided the ISM office in Beit Sahour, confiscating computers, photographs and files and arresting three women on the premises. 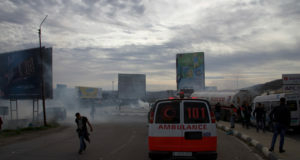 Adding insult to injury, Israel decreed on May 11 that all internationals entering Gaza must sign a “waiver” absolving Israeli soldiers from any deaths or injuries they inflict. Nonetheless, a respite from these images of escalating brutality was offered May 17 with an evening of poetry, music and recollections of Rachel Corrie in the Hyatt Regency Orange County Hotel. A violin solo by Dr. Nabil Azzam, a debke dance by children of Birzeit, and poetry by KPFK newsman Jerry Quickley and Dima Hilal opened a window onto Arab culture for the more than 600 guests on hand. ISM spokesman Adam Shapiro vowed that the Israeli clampdown on international rights activists will not succeed. Acknowledging that Israel has billions of dollars, and weapons and bulldozers, Shapiro said the Palestinians have sumud, a unity and strength of knowing their cause is just, which cannot be taken away. He urged people to check the ISM Web site and to join in ISM Freedom Summer 2003. In presenting the Muslim Public Affairs Council Courage Award, Dr. Maher Hathout said that courage is not the opposite of cowardice, but rather the principle of standing up to injustice. Rachel’s father, Craig Corrie, disclosed that, ironically, when he served as a combat engineer with the First Air Cavalry in Vietnam in 1970, he had been in charge of bulldozers. “But I didn’t harm anyone,” commented the tall, greying insurance actuary. He now realizes, he said, the courage it took for his daughter to put on her ISM vest every day and witness calculated cruelties and human rights abuses. In her hometown of Olympia, WA, she had encouraged her parents to talk to the street people and feel their pain. Cynthia Corrie acknowledged that over the past few weeks she has found it difficult to adequately describe her daughter, because there were so many dimensions to her character. Rachel sent many e-mails home from Gaza, always stressing the need for Palestinian voices to be heard in the U.S. and marveling over the Palestinians’ ability to organize against all obstacles. Rachel grew up in a home on two acres near Puget Sound, Mrs. Corrie said. By the fifth grade, Rachel wrote that she wanted to be a lawyer, dancer, actress, mother, wife, children’s author, distance runner, poet, pianist, pet store owner, astronaut, envioronmental and humanitarian activist, psychiatrist, ballet teacher and the first woman president. In the seventh grade she organized a student walkout on behalf of the teachers. When her mother told her she shouldn’t go through with the strike, Rachel said she had to because she’d already called a press conference. During her sophomore year in high school, Rachel was an exchange student and lived with a Russian family for six weeks in the Sakhalin Islands. Rachel took one year off from her studies at Evergreen State University to serve in the Washington State Conservation Corps. Her volunteerism included weekly drop-ins over three years to mental patients in a hospital diversion house. “Some of these patients talked publicly after Rachel’s death and mentioned the positive impact she had on their lives,” Mrs. Corrie continued. The emotional finale was the presentation of a hand-embroidered Palestinian jacket from Sameera Sood of the Palestinian-American Women’s Association to Mrs. Corrie. Other organizers of the ISM fund-raiser were American Friends Service Committee, Los Angeles-Palestine Solidarity Committee and MPAC. And, as her teacher once predicted, Rachel has made a difference. Olympians are carrying out Rachel’s endeavors to establish a sister city relationship with Rafah and, according to Phan Nguyen, Olympia’s ISM coordinator, many people are signing up to serve with ISM this summer. 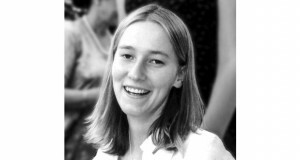 The Corries have established the Rachel Corrie Foundation for Peace and Justice. It may be difficult to stop Israeli atrocities, but much can be done to expose Israel’s new push to expel foreigners bearing witness to its assault on the Palestinian population. A noisy, attention-getting May 16 demonstration was arranged within four days at the Los Angeles Israeli Consulate, where passing motorists honked their horns and gave the V sign to protesters on both sides of Wilshire Boulevard. Many protesters wore hastily sewn orange and yellow day-glo vests, the uniform of International Solidarity Movement workers in Gaza and the West Bank. One month before Rachel Corrie was murdered, Shaik said, he had called the U.S. Consulate to say that American citizens were being threatened by Israeli soldiers and settlers. The response was that the Americans shouldn’t be there. “What if Americans are killed?” he asked. The consular officer responded that that was no excuse. Avery was shot in the face April 5 in Jenin by soldiers in an armored personnel carrier who opened fire on unarmed ISM members. Protesters sent a letter to the Israeli Consulate demanding Israel rescind requirements that foreigners entering Gaza sign waivers absolving the Israeli army if they shoot them.